At Laparoscopic Surgical Center of New York, our skilled, highly-experienced surgeons can help eliminate the sour, burning symptoms of gastroesophageal reflux disease (GERD). Whether you are suffering from a mild, moderate, or severe case of the disease, our doctors can perform anti-reflux surgery at their New York, NY, office to eliminate the causes. What Causes the Burning Sensation? When you eat food, it travels from your mouth to your stomach through a long tube called the esophagus. At the end of the esophagus is a small ring of muscle called the lower esophageal sphincter (LES), which acts as a one-way valve. This small valve allows food to enter into the stomach. However, if the valve does not function properly and fails to close, the stomach acids can travel back up into the esophagus, causing chronic coughing, chest pain, and painful heartburn. If left untreated, GERD can progress into more than just periodic pain and burning sensations. Over time, the stomach acids can begin to injure the sensitive lining in the esophagus. This could result in bleeding or the creation of cancerous cells. Some patients may be able to improve the symptoms of GERD through a series of lifestyle changes and drug therapy. However, patients who do not respond well to these alternate therapies may be a good candidate for a surgical procedure called fundoplication, or laparoscopic anti-reflux surgery. Our surgical team is highly experienced in performing this minimally invasive surgery. During fundoplication, your surgeon will make several small incisions, roughly five to 10 millimeters in size along the abdomen to allow access to your hiatal hernia, stomach, and esophagus. A small camera will be inserted, called a scope, through the incisions to help guide the surgeon. The LES will be recreated by wrapping the upper part of the stomach around the end of the esophagus. 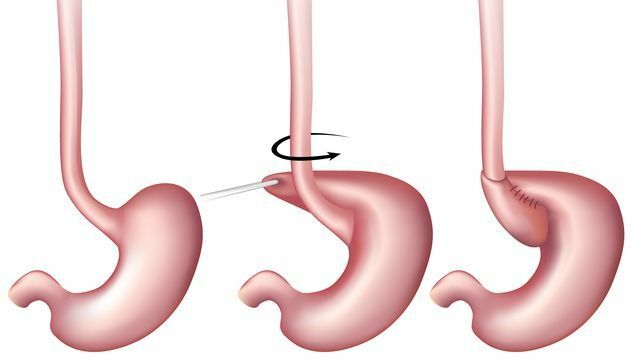 By recreating the LES, acids will not be able to burn and reverse into the esophagus, This surgery allows the esophagus to heal, strengthening the valve that connects the stomach and esophagus. Most patients will require a hospital stay for one to three days after their surgery. Prior to being released, we will provide you with a series of diet and activity guidelines. Typically, patients are instructed to only drink water on the night following the surgery, progressing to other clear liquids the next day. Soft foods can typically be consumed for the first few days, and within three to four days patients can gradually begin to eat solid foods. A follow-up appointment is scheduled one week after your surgery to assess the wound site and your recovery. During this time, we will also provide you with additional information on the type of activities and dietary guidelines that will lead to a quick and successful recovery. If left untreated, GERD can progress into more than just periodic pain and burning sensations. Over time, the stomach acids can injure the sensitive lining in the esophagus. This could result in bleeding or the creation of cancerous cells. To learn more about laparoscopic surgery and how it can eliminate acid-reflux, schedule your consultation.